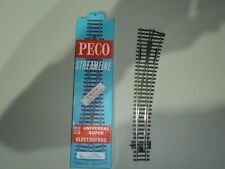 Peco Oo Gauge Electrofrog 3 Way Point. Appears to be new but no box so selling as used. No fishplates. This item although listed as used was bought for the club layout opened but never used and is in as new condition. Peco SL-E87 Code 100 Curved LH Point Unused and still in Polythene Wrapping with Box. Bought For A Layout But Never Used. As New Condition. Keith Barber Models . Here I Have Peco Streamline Points OO/HO Gauge Nickle Silver E86XX (Electrofrog) Large Left Hand Curved. Here I Have Peco Streamline Points OO/HO Gauge Nickle Silver E86XX (Electrofrog) Large Radius Right Hand Curved. 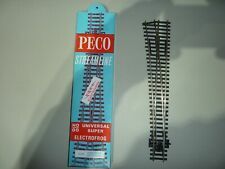 Here I Have Peco Streamline Points OO/HO Gauge Nickle Silver SL-E89 (Electrofrog) Left Hand Large Radius. It operates perfectly and is in its original box with insert sheets. Peco SL-E91 Code 100 Electrofrog Small Radius Right Hand Point (OO gauge) Small radius right-hand point. Nominal radius: 610mm (24in) Angle: 12º Length: 185mm (7 ¼in). OO gauge Code 100. 80 thou (.080") 2.0mm thick clear plastic card. Code 100 Electrofrog. Peco Streamline SL-E91. Small Radius Right Hand Point. Code 100 Electrofrog Large Left Hand Point. Model Railway. Currently we have over 10,000 products available on line. The cheapest way of transporting will be chosen. Electrofrog Large Right Hand Point. PECO SL-E88. 1:76 OO SCALE. Model Railway. Currently we have over 10,000 products available on line. Peco SL-E88 Code 100 Electrofrog Large Right Hand Point. Large Radius Turnout. R/H Electrofrog. Nominal radius: 1524mm, Angle: 12 degrees, Length 258mm. Code 100 Electrofrog. Peco Streamline SL-E95. Code 100 Electrofrog. Peco Streamline SL-E96. Small Radius Turnout, L/H Electrofrog. Nominal radius: 610mm, Angle: 12 degrees, Length:185mm. Code 100 Electrofrog. Peco Streamline SL-E92. Small Radius Left Hand Point. L/H Electrofrog. Nominal Radius:914mm, Angle: 12 degrees, Length:219mm. Code 100 Electrofrog. Peco Streamline SL-E87. Large Radius Left Hand Curved Point. Code 75 Electrofrog. PECO SL-E191. We will always help you to have a 100% positive happy buying experience. Small Radius Turnout. L/H, Elecrofrog, Angle: 12 degrees, Length: 219mm. Minimum space turnouts that are particularly useful in sidings and marshalling yards or indeed anywhere that is restricted on the layout. R/H Electrofrog. Nominal Radius:914mm, Angle: 12 degrees, Length:219mm. Peco Point. Scale / Type: OO Scale. We will always help you to have a 100% positive happy buying experience. Our Code: PESL-E95. We will always help you to have a 100% positive happy buying experience. Our Code: PESL-E91. Small Radius Turnout, R/H Elecrofrog. Nominal radius: 610mm, Angle: 12 degrees, Length:185mm. Part Number: SL-E91. Scale / Type: OO Scale. Curved Double Radius Turnout. R/H Electrofrog.Nominal radii: Outside 1524mm, Inside 762mm. A beautiful example of the prototype in miniture. We will always help you to have a 100% positive happy buying experience. 3-way Electrofrog. Nominal Radius: 610mm, Angle:12 degrees, Length:220mm. We will always help you to have a 100% positive happy buying experience. Our Code: PESL-E99. Part Number: SL-E99. Add to favourites. Get In Touch. WORKING ORDER: Yes. 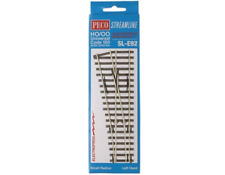 Peco SL-E92 Code 100 Electrofrog Small Radius Left Hand Point (OO gauge) Small radius left-hand point. Nominal radius: 610mm (24in) Angle: 12º Length: 185mm (7 ¼in). OO gauge Code 100. 80 thou (.080") 2.0mm thick clear plastic card. PECO OO GAUGE. LEFT HAND CURVED POINT. L/H Electrofrog. Nominal Radius:914mm, Angle: 12 degrees, Length:219mm. Peco Point. Scale / Type: OO Scale. We will always help you to have a 100% positive happy buying experience. Our Code: PESL-E96.